The inferno that raged through Notre Dame Cathedral for more than 12 hours destroyed its spire and its roof but spared its twin medieval bell towers, and a frantic rescue effort saved the monument’s ‘‘most precious treasures,’’ including the relic revered as Jesus’ Crown of Thorns, officials said Tuesday. 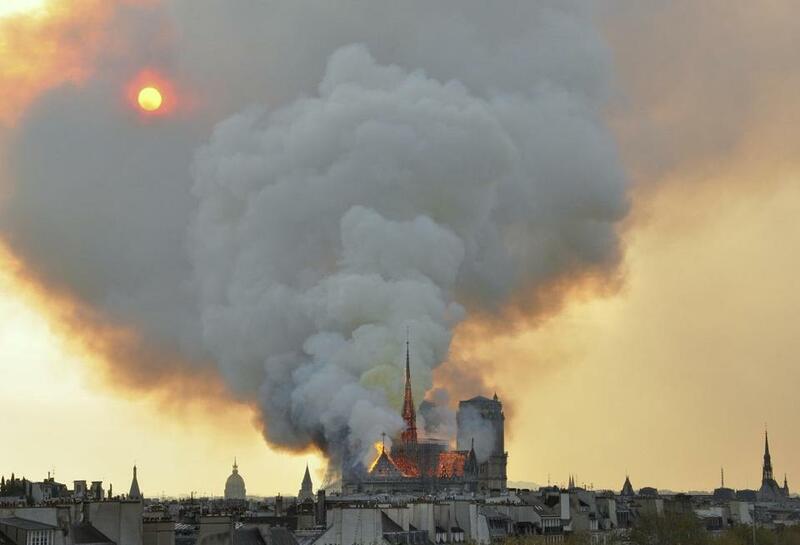 Paris prosecutor Remy Heitz said the inquiry into the fire would be ‘‘long and complex.’’ Fifty investigators were working on it and would interview workers from five companies hired for the renovations to the cathedral’s roof, where the flames first broke out. ‘‘Notre Dame has survived the revolutionary history of France, and this happened during building works,’’ said influential former Culture Minister Jack Lang. Fames and smoke rose from the blaze at Notre Dame on Monday. 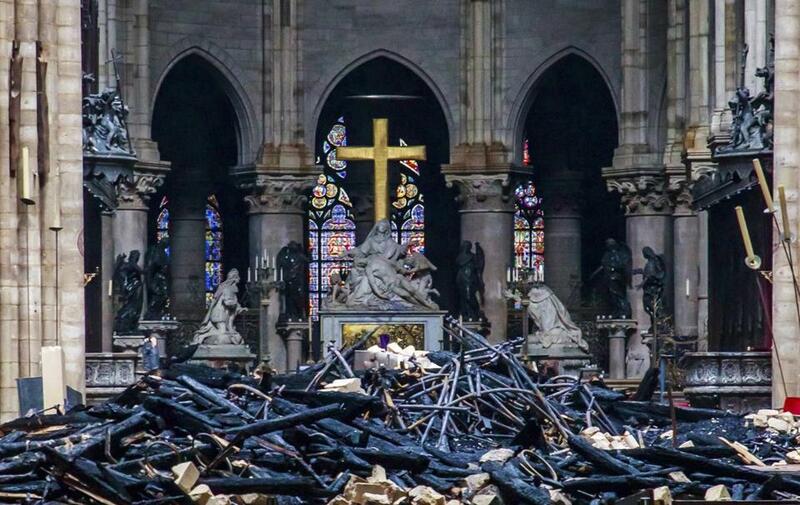 ‘‘The works of art, the most precious treasures were secured last night,’’ Riester told reporters, thanking teams from city hall, the culture ministry, firefighters and the bishopric who worked to save the items. Some of the works were being transferred from City Hall to the Louvre, where they will be dehumidified, protected and eventually restored. The minister said the cathedral’s greatest paintings would be removed starting Friday. ‘‘We assume they have not been damaged by the fire but there will eventually be damage from the smoke,’’ he added. ‘‘The task is — now the risk of fire has been put aside — about the building, how the structure will resist,’’ said Junior Interior Minister Laurent Nunez. The first 24-48 hours were crucial to protecting the stone and wood structure from water damage and assessing the next steps, she told The Associated Press, warning that parts of the cathedral remain ‘‘extremely fragile,’’ notably hundreds of tons of scaffolding around the spire that collapsed. Notre Dame is part of a UNESCO heritage site and UNESCO has offered its expertise. 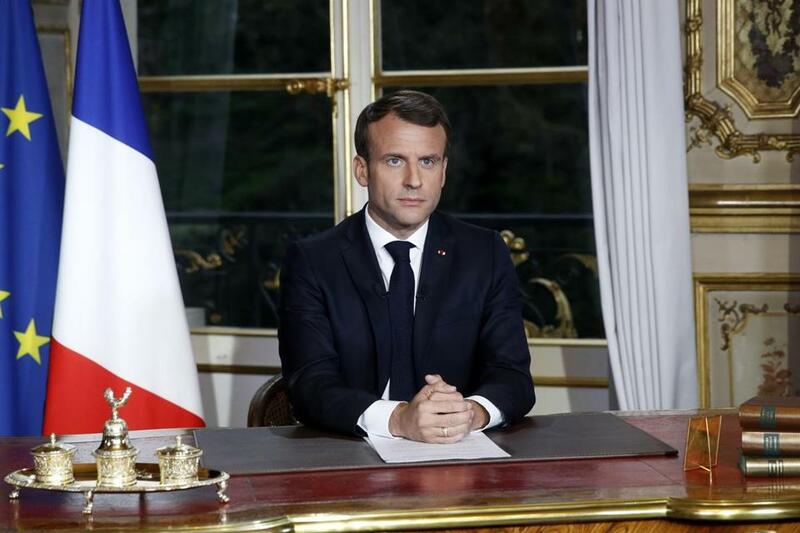 Pope Francis offered his prayers that Notre Dame, the ‘‘architectural gem of a collective memory,’’ will once again be a shrine to the Catholic faith, a symbol of the French nation and a spiritual and architectural gift to humanity. 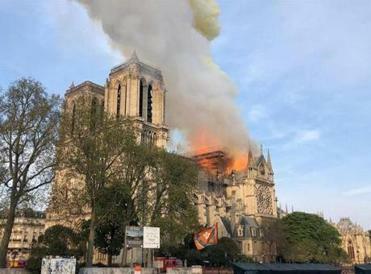 The roof cannot be rebuilt exactly as it was because ‘‘we don’t, at the moment, have trees on our territory of the size that were cut in the 13th century,’’ said Bertrand de Feydeau, vice president of preservation group Fondation du Patrimoine, adding the roof restoration work would have to use new technology. ‘‘It has not burnt, but no one can tell whether it has been damaged by water. Nobody knows if it is a functioning state or will need to be restored,’’ he told AP. 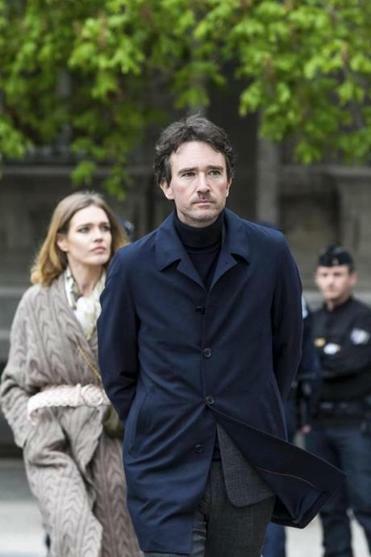 Antoine Arnault, son of LVMH president Bernard Arnault, and his wife, Russian model Natalia Vodianova, arrived at Notre Dame on Tuesday.